CheeseScience.net: Christmas is a coming...! 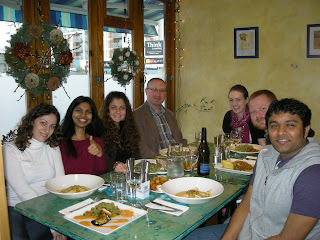 Christmas must be around the corner since the cheese researchers of Lab 232 had their annual lunch last Friday! From left to right, Diletta, Shirinda, Veronica, Paul, Anna, Kim and Himanshu. This year we had four different nationalities around the table (Ireland, Italy, Norway and India). As usual, we went to Cafe Paradiso, a prize-winning vegetarian restaurant on Lancaster Quay near UCC. I strongly recommend Cafe P should anyone be visiting Cork; the food is superb. 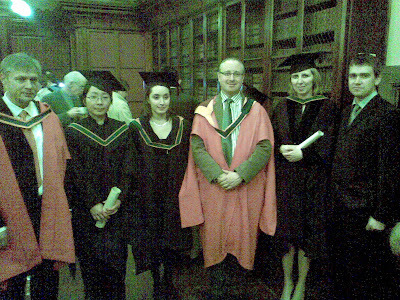 Last week also saw the winter conferrings at which our 2007-08 MSc (Applied Science) in Food Science graduated.